Recap: Kamen Rider Drive, Episode 37 – Who's Angling for the Ultimate Taste? 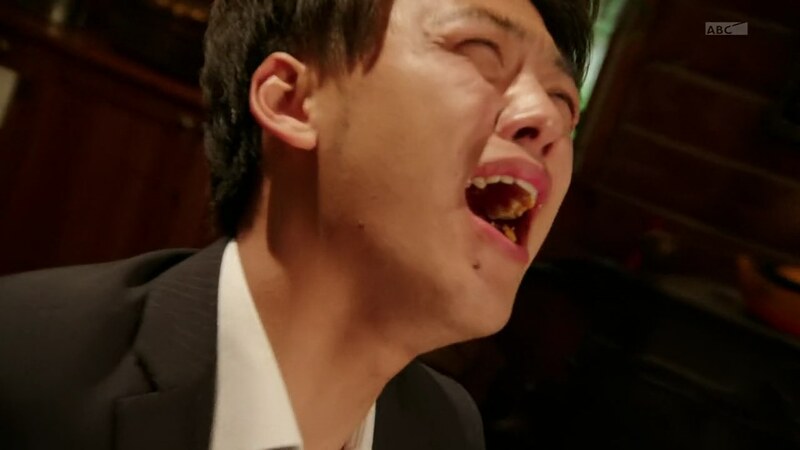 Shinnosuke has been able to put everything relating to his father’s murder aside so he can focus on defeating the Roidmude. Meanwhile, Chief Jun announces to the SID that they are officially being acknowledged and are now classified as a detective department. Rinna shows them a board of all the Roidmude they’ve identified, destroyed and yet to be found. 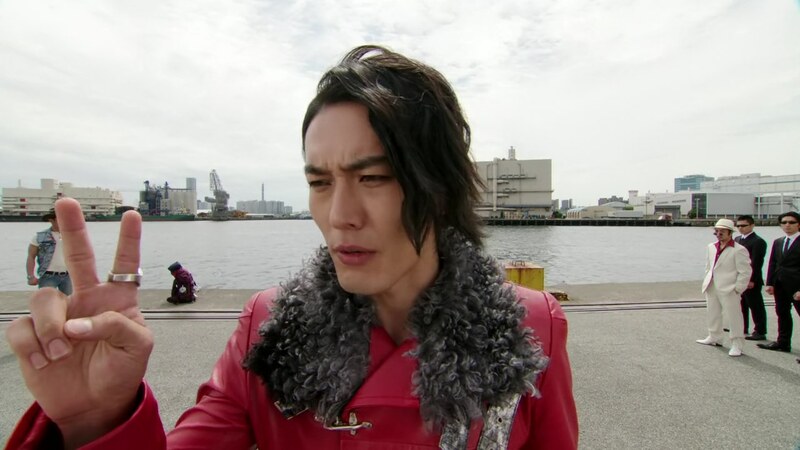 Kiriko notices there’s been a lot of Roidmude bursting into flames lately. Thanks to a piece of burnt paper Shinnosuke picked up from the latest fired up Roidmude scene, Kyu has managed to lead them to a secret, hidden French restaurant called Supreme. Once only the subject of urban legend blogs, Kyu has managed to use the paper to find the place. Supreme has a reputation of having food so delicious it shuts people’s mouths shut so they can’t ever find it again. 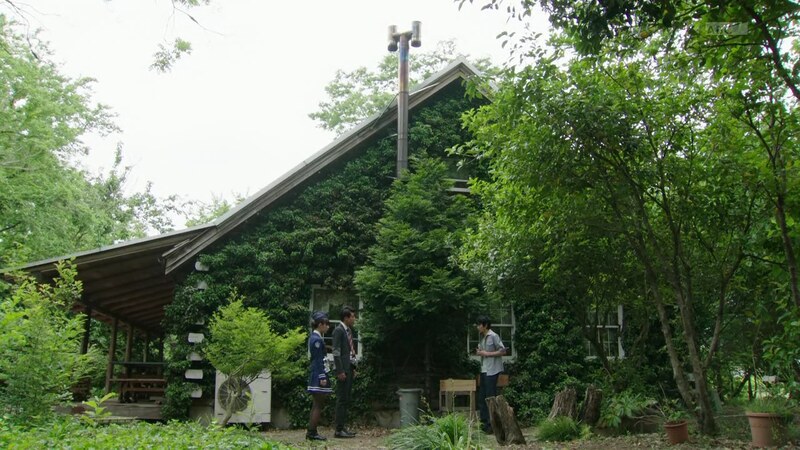 They head inside to question the head chef Okumura about the most recent man/burned Roidmude. The chef offers to get them the reservation list. Meanwhile, Kyu tries to explain to Shinnosuke, Kiriko and Otta that just being here in this restaurant is an experience worthy to savor. Okumura is touched by Kyu’s words and tells his sous chef Masukawa to prepare some food for them. Apprentice cook Itagaki Yuu is fumbling around with glass jars nearby. 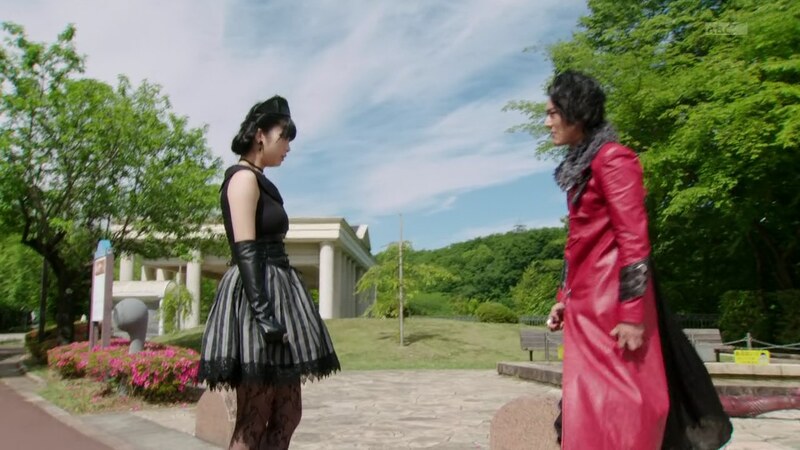 Across town, Heart has summoned Roidmudes 008 and 006 from abroad to talk about three things: Defeating the Kamen Riders and their police associates, Recovering or destroying Banno Tenjurou and Achieving ultimate evolution and gather the Promised Number as soon as possible. First though, 006 warns Heart to be wary of those close to him as he shows an article about the latest burnt comrade. Back at Supreme, Okumura tops off the special dishes with some glowing sauce. As soon as the four take a bite, they are in heaven. AMAZING FOODSTUFFS!!!!!!!!!!!!!!!! Kyu knows the secret is the legendary En Fleurs Sunset, the secret sauce. Belt-san is upset he can’t eat. Medic is watching the restaurant from outside. Number-only Brain asks if Heart knows what she’s up to because this is some risky stuff. But more importantly, when is she gonna fix him? In a warehouse, Gou is with his tablet father when Chase pops up behind him. Chase wants to thank Gou and Banno for saving Yukari. Also, isn’t it time Banno reunited with Krim? Banno reminds Chase that Gou does not want Kiriko to know he is her father. Gou explains that he found out while he was in the States and has been doing everything he can to hide the truth. Banno says it is only natural he hide the truth of his despicable work from his children. At least, that’s how Krim definitely feels. Chase says Banno can atone for his sins, but Banno says there’s another side of Krim that definitely won’t believe him. They are suddenly attacked by 006 and his goons. 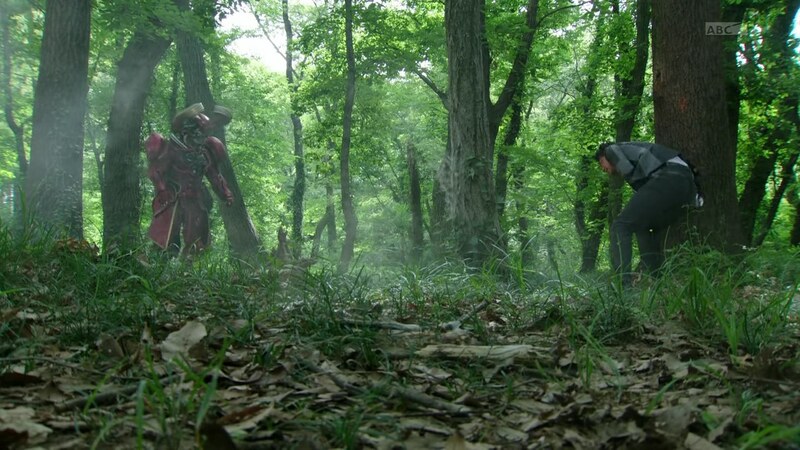 Chase tells Gou to take Banno and run, but they both henshin. 006 tries grabbing the tablet, but Gou keeps his father safe. 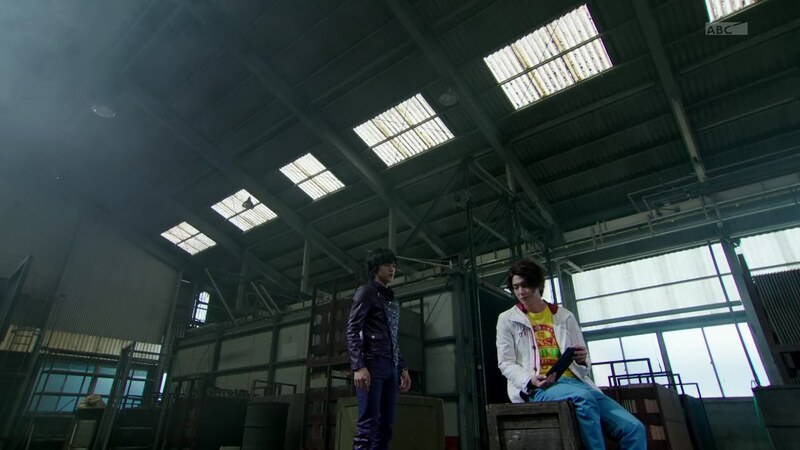 Banno tells Gou they must run. And when they go, so do 006 and Co.
Back at the Pit, Belt-san tells Rinna about the food and his analysis. He stills feels bitter about not being able to eat. But also, there’s something strange about the restaurant. Shinnosuke, Kiriko and Otta are not listening though as they are still in a food high. Rinna snaps them all out of it and they concentrate back on the case. They realize this restaurant attracts more of a Roidmude clientele. But why? And what’s making them spontaneously combust? Back at Supreme, the apprentice chef Itagaki has just taken a bottle of secret sunset sauce. He quietly leaves the restaurant, but runs into Shinnosuke and Kiriko. Itagaki runs and they follow. Roidmude 090 appears and fuses with Itagaki. Shinnosuke henshins straight to Type Tridoron. Belt-san asks to take the wheel so he can let out his frustrations about not being able to eat. While fighting, Medic appears with a reaper and tells the Roidmude Cook to hand over the bottle. She decides to forcibly take it from his person and splashes the golden sauce at the reaper. The reaper burns up and seems to be powered up or something. Shinnosuke takes the wheel and they realize all the other Roidmudes burning up is because of the golden sauce. Medic admits all those Roidmude were live test subjects in her experiment on ultimate evolution. She took the lives of her comrades just show humanity can be destroyed as soon as possible. Medic tells Cook to kill both Shinnosuke and the reaper. But Heart appears and blocks Cook. He removes the golden sauce from the reaper and demands Medic explain herself. But he actually doesn’t want to hear it. He believes there’s honor in one reaching ultimate evolution on their own. Heart goes Roidmude and challenges Shinnosuke. They battle. Heart is able to push back against even Type Tridoron. He demands Shinnosuke take out his cannon. But Shinnosuke instead uses a Max Flare, Funky Spike and Midnight Shadow tire mix. They both attack. Big explosion. Their women, Kiriko and Medic, run to them. Shinnosuke gets thrown into the forest, dehenshined. And without Belt-san. Heart walks toward him. So the episode started out a little odd. Especially with Shinnosuke saying he’s gotten over his dad’s murder faster than the story arc appeared out of nowhere. And then the spazzing over food when we’re supposed to be in the final arc. But, the last third of the episode was alright. Medic has finally done something. And it has not made Heart-sama very happy. I assume we’re leading into Heart’s ultimate evolution very soon. But then after that, who knows where they’re going. They keep mentioning Promised Number but that still means nothing at all after 35 episodes. I’m at least more interested in that whole thing with Kiriko eventually finding out her father is a tablet created the Roidmude. Yes, her father created the guy she’d been fawning over (though not anymore after he joined the team? lol). ← Recap: The Amazing Race Canada 3, Episode 2 – "I'm gonna pee myself." Pretty much an apt description of the series right now. It’s as if they are rushing to try and get back to the main plot they left hanging some 20 episodes ago. Still am not fond of the series’ wildly misplaced humor. And Drive is definitely not the best at balancing its tone. Or its overall story either, actually. Heh.